Too many of us are paranoid about the word law and find it hard to hear a scripture like this. But we must recognize that the goal of the New Covenant of grace and the gift of the Spirit is that God’s law is written on our hearts and demonstrated in our lives. God is not concerned that it be written on tablets of stone. Jeremiah prophesied of such a day when the focus of God’s people would be their desire to do God’s will — a passion to love the things our Father loves and despise the things he despises. 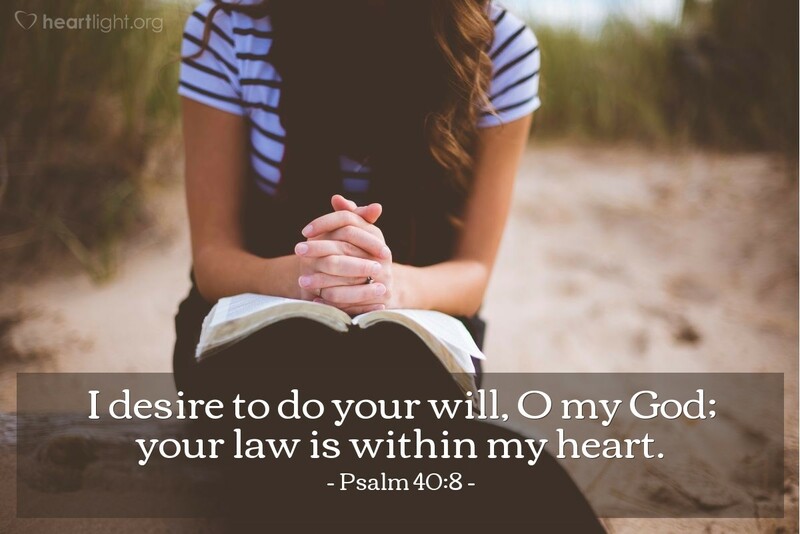 Abba Father, I do want to do your will. I want to please you, glorify you, and lead others to you. Give me spiritual discernment to know your will and spiritual courage to do it today. I want your character and righteousness to inform my heart when I am tempted by Satan not to live for you. Humble me gently when I am wrong or have lost my way. In the mighty name of Jesus I pray. Amen.